The Sony KDL-55EX723 is an advanced attempt at a living room all-rounder, with a super-slim 41mm depth, online goodies galore and a 3D mode, though you will have to add the glasses yourself (Sony now sell them for as little as £60); think of it as a chance to upgrade to 3D in the future, and one reason why this is in Sony's 'Essential' Series of Bravia TVs. That slim depth is down to the employment of Edge LED backlighting, though there are clues as to why this behemoth sits atop Sony's Essential EX Series; it requires a USB dongle to link to a Wi-Fi home network, while the two-tone mirrored metallic/gloss black design doesn't hold a candle to pricier Sony sets. The biggest problem in terms of value, however, it this set's lack of 3D specs in the box. Sony's use of differently named series of Bravia TVs can be confusing; while this 'Essential' EX723 model includes 200Hz and 3D capabilities, the step-down – but almost identically named – EX524 models, don't have either. Its stable-mates include the 46-inch Sony KDL-46EX723, 40-inch Sony KDL-40EX723, 37-inch Sony KDL-37EX723 and the 32-inch Sony KDL-32EX723. The lower-end EX524 Series ships as the 46-inch Sony KDL-46EX523, 40-inch Sony KDL-40EX523 and 32-inch Sony KDL-32EX523. More basic performances comes from the EX320 Series and entry-level CX523 Series. A class above the KDL-55EX723 itself is Sony's 'Network' NX723 Series, which boast a slimmer panel and Sony's 'monolithic' (i.e. rather plain, black) design as well as an integrated Wi-Fi module and, of course, both Freeview HD and 3D – this time with 3D specs in the box. 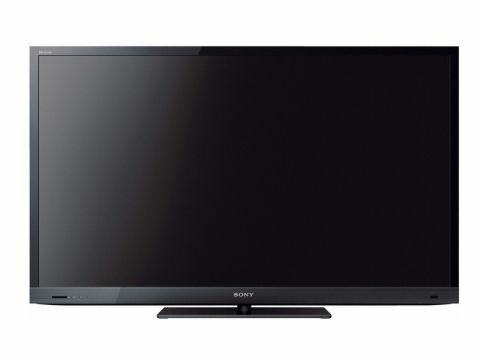 Sizes comprise the 46-inch Sony KDL-46NX723 and 40-inch Sony KDL-40NX723. If you want Sony's best value all-rounder at this huge 55-inch size, save up an extra £500 and plump for the KDL-55HX823, Sony's flagship in its 'Cinematic' HX Series that manages a much better handling of 3D material and tougher (read: child-proof) 'gorilla' glass.